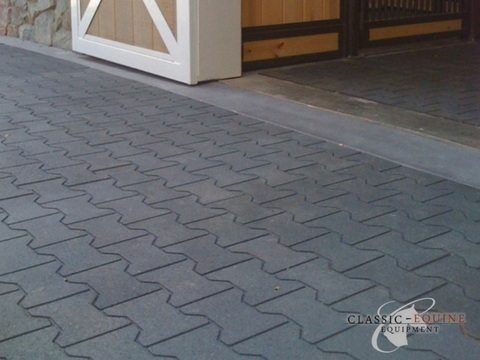 Classic Equine Equipment offers Tru-Step® Interlocking rubber Pavers for a safe, nonslip barn surface. 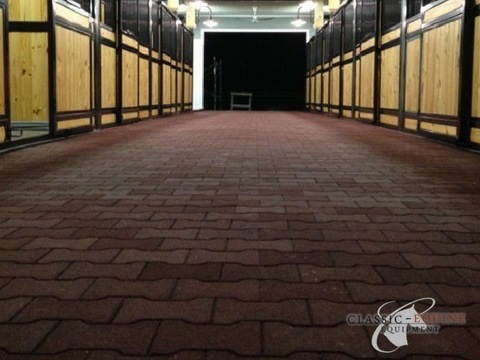 Our rubber pavers can be used for Horse Barn Aisle flooring or walkways, grooming stall flooring, or any where you need a safe surface for you and your horse. They are chemical, abrasion and weather resistant and will not shrink, warp or crack. 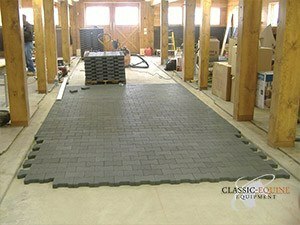 Our rubber barn pavers provide a safe surface further minimizing risk of injury to horses, riders or groomers. Available in two different thicknesses 1.5" (40mm)thick & 0.75" (20mm)thick. 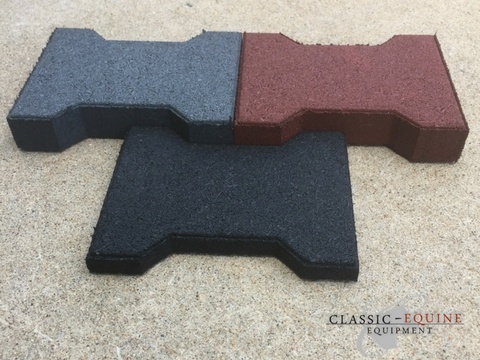 We offer our Interlocking Rubber Pavers in two different thicknesses. 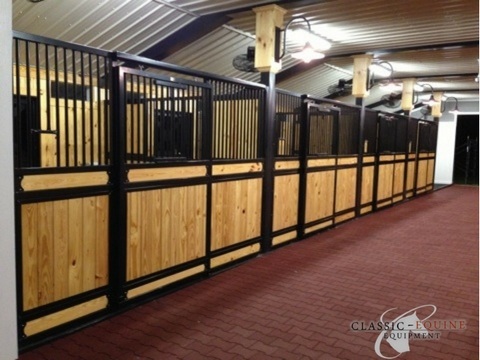 For existing concrete barn aisles, our 0.75" pavers can be applied with adhesive, transforming your barn aisle into something that is not only attractive but also provides a safe footing for you and your horse. Our 1.5" rubber paver can be applied directly to a compact base material, eliminating the additional cost of a full concrete pour. Tru-Step® Pavers are easy-to-install interlocking rubber pavers that provide long-lasting protection and comfort for a variety of equine, residential and commercial flooring applications. They offer exceptional durability, comfort and slip resistance while creating an aesthetically pleasing and clean environment. 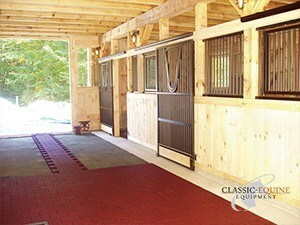 Tru-Step® Pavers are ideal for barn corridors, entrance areas, horse stalls, wash bays, paddock areas, patios and more. Tru-Step® Pavers are manufactured from shredded rubber and available in black and terracotta. Their 1½” (40mm) thickness provides superior shock absorption and protection. Tru-Step® Pavers are durable enough to drive tractors and cars over them. Due to excellent self drainage and slip resistance surface they are particularly useful in wash bays or other wet areas.Ideal for replacing dirty, dusty, slick or hard surfacing. Extremely durable and resilient, as well as sound-absorbing which produces a quieter environment. Easy to install and maintain, these interlocking pavers can be used indoors or outdoors, as either temporary or permanent flooring. 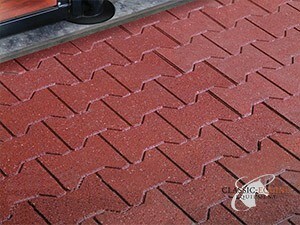 Chemical, abrasion and weather resistant, these pavers will not shrink, warp or crack. Coverage is calculated at 3.24 pavers per square foot plus 2% overage for partial cuts. Tru-Step® Pavers are UV resistant and will withstand freezing and thawing conditions. Maintenance is easy. Use a broom, leaf blower, pressure washer or vacuum. Pavers can be laid on various surfaces such as concrete, asphalt and compacted stone dust.